The Presentation of the Lord pulls many favorite mementos from the Catholic cupboard: candles, blessings, Christmas and church. The Mass of February 2 begins with a blessing of lighted candles held by the faithful, who glow with the memory of the birth of Jesus. The origins of the feast lie in ancient Jewish custom. On the 40th day after childbirth, parents brought the infant to the Temple to present him/her to the Lord and to purify the mother. St. Luke tells us that Joseph and Mary sacrificed two birds for the occasion after the birth of Jesus. Count up 40 days after Christmas and you’ll come to February 2. Until the 1960s, we used to call this day “The Purification of Mary.” The title changed for several reasons. We no longer believe that women who give birth need purification, and the true significance of the feast concerns Jesus coming to the Temple. He is the Promised One, whose light will shine, beaming rays of hope to all the world. Also on the old calendar, this feast closed the Christmas season. Now we end the Christmas season with the Baptism of the Lord. So, even though the date for the Presentation still depends on Christmas, it has become a feast of ordinary time. Since it is a feast of the Lord, it takes precedence even when it falls on Sunday. The candles you hold for the blessing may come from your parish, or you may bring your own from home. If you like to use blessed candles for household prayer throughout the year, here is your chance to get them. On the day following this feast, our calendar permits the option of commemorating St. Blase, a bishop and martyr of the early church. Legend has it that he once freed a child from choking, and while imprisoned under persecution he received light from friends who visited his cell with candles. Our church still uses candles from the Presentation of the Lord in the blessing of the faithful’s throats on St. Blase’s Day. Blessed candles in our churches and homes signify the living presence of Christ in our community. With Christ as our light we warm a lost and wintry world. When we celebrate one of the major feast of Our Lord, The Presentation. This feast is also known as Candlemas Day, since traditionally candles used in the Liturgy were blessed on that day, with a solemn procession in which all carried lighted candles before the Mass. Forty days following the birth of a child, a Jewish mother, having been "purified" of the birth-blood, came into the Temple with an offering to the Lord. Since every child belonged to God, the parents would "buy back" their child. Poor people, like Joseph and Mary, were obliged to bring only two inexpensive birds, like turtledoves or pigeons. When Jesus was presented in the Temple, He was recognized immediately as the Messiah by a pious old man, Simeon, and a devout widow by the name of Anna. Simeon recognized, in this child, the fulfillment of the prophecy of Micah that we hear as today's first reading: "Thus says the Lord God: Lo, I am sending my messenger to prepare the way before me: and suddenly there will come to the temple the Lord whom you seek … ." This messenger is likened to a refiner of silver who cleanses the sons of Levi (who are priests) of any impurities in a very hot fire. God had promised Simeon that he would see this Child before he died. Simeon says to Mary, "And you yourself a sword will pierce -- so that the thoughts of many hearts will be revealed." The widow, Anna, also recognizes this child as special, although we don't know what words she said. Although but a mere child, Jesus enters the Temple as a divine, yet human High Priest. By coming in human flesh and blood, He comes already bringing God's forgiveness. He brings understanding of our weakness, for which He will show His mercy, as we read in today's Second Reading from Hebrews. 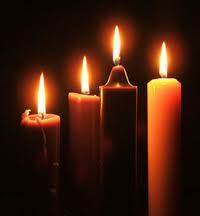 On this feast, all of us who will follow Christ our Savior, must become candles to be purified of sin. In being consumed, we ourselves become light to illuminate the world around us with Jesus' truth and love. What a beautiful feast for us in this darkest and coldest time of winter, to be transformed into Jesus! May we be encouraged to let His light shine into the darkness that surrounds us!